The Taming of the Shrew came first, when I was 7 or 8 – a community theatre production in their tiny theatre in the middle of a cornfield. Then, when I was 9 and bored with the 4th grade reading list, my teacher gave me special permission to read Romeo and Juliet for a book report. My mom and I read it together: first the story from Lamb’s Tales from Shakespeare, then the actual play, side by side on the couch, trading roles, talking through each scene, playing with the language. I’ve spent this semester as an intern in the Education Division of the Folger, and I’m finding myself more in love with these words than ever before – both how and what they say. It would be cliché to extol the magnificence of Shakespeare’s metaphors and the intricacies of his characterizations, but what I’m marveling over are the lessons and truths he could convey. At the Secondary School Festival, I saw students who had found the sweetness in the lines years before and I saw students discovering the language for the first time. No matter how new they were to this crazy world we call the theatre, they learned what it feels like to stand in front of a few hundred people and say centuries-old lines that still apply to today. The costumes and the details are a little different, but these stories are told everyday in real life: people lie, fall in love, pretend to be something they’re not. The biggest thing I’ve learned these past few months is this: to be able to teach these lessons, we have to learn them ourselves. Not literally – I’m not advocating usurping your brother’s dukedom just so you can learn how it feels to be reunited. In the broader sense, if you look for Shakespeare’s stories in everyday life, you will find them. The words will come alive on the page and your life will be that much more dramatic (in a good way). Emily DenBleyker is a junior at Gordon College in Massachusetts. 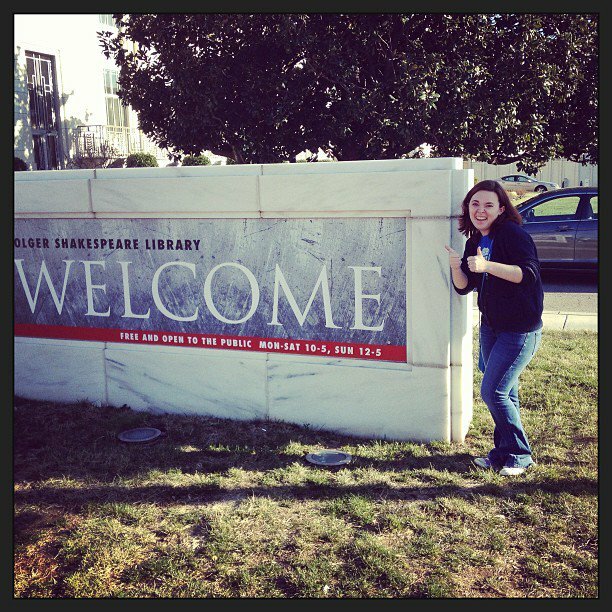 She is spending this semester in Washington DC with the American Studies Program and interning with the Education Division of the Folger Shakespeare Library. After graduating next May, Emily hopes to work in theatre education. Or literature. Or film criticism. Or marketing.